I’m not very good at updating this thing, am I? haha We’ve found out our little baby to be is a girl which we are excited about. We only said boy initially because they’re easier. I say that being a female myself, growing up with a high maintenance sister & previously dating a guy who had both a son & daughter. Don’t get me wrong – I loved them both but she had MAJOR attitude from an early age & unfortunately I remember my bad attitude through my teenage years. But we’re VERY excited for her to get here. She’s already been spoiled a great deal because Auntie April (my sister) has already gone shopping for the baby quite frequently already. No luck on the house yet. We’ve found several that we like from the website but when we get there, we know it’s just not the one. We still look but we’ve accepted the fact that we may still be in my house come December when she will be here. Paul was a liar as far as doing the dishes but he did buy me a dishwasher which I must say has made a great improvement. I don’t despise dishes near as bad & I’ve grown to love my dishwasher & never want to live without one again haha It’s definitely made cleaning the kitchen much easier. I don’t want to jump the gun & say I’m in the nesting phase because it hasn’t been major & the house still has a ways to go, but I have made some improvements & I’m still working on it daily. The first 3 months I was too tired & sick to do much of anything but after that I’ve felt pretty good most days. However the fatigue is coming back so some days I struggle to do anything besides throw a load of laundry in. My main thing these days is to get the house in order so it won’t be so hard to maintain plus people will be coming over once the baby is home so I’ve got to whip it into shape before long. It’s coming along, just slower than I’d like. When I’m reading DIY or organizing blogs I notice how sometimes they have the “after” pictures but not the “before” & they say how they wish they would’ve thought to stop & take a “before” so they could show the changes. I used to laugh at that & think I’ll never get that caught up in organizing that it would’ve been worth taking a “before” picture but now I find myself there & I love it! 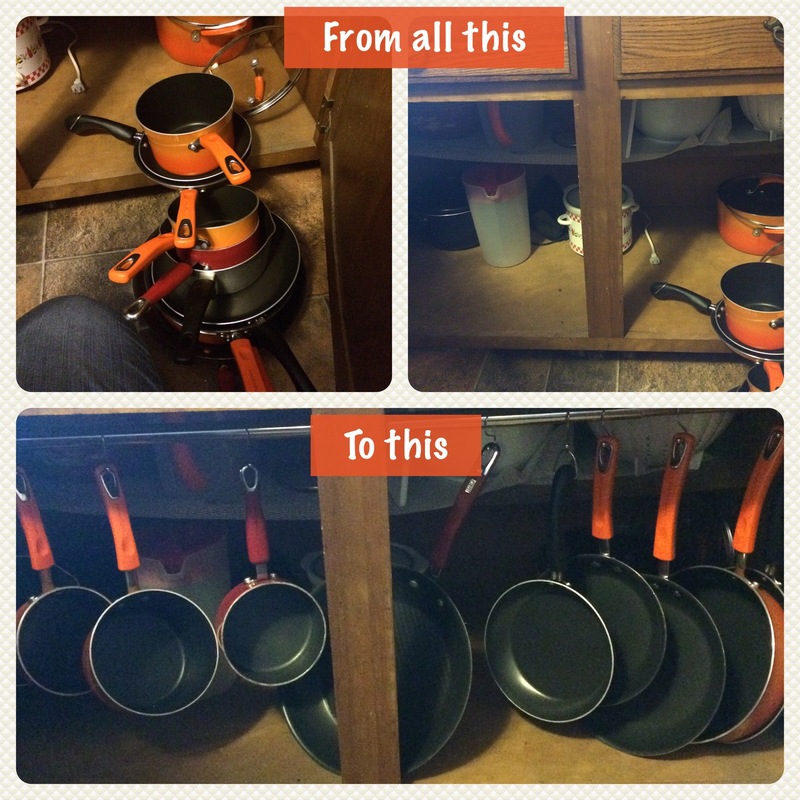 I hate that I forget the “before” picture because it does make the impact of the “after” that much better, but I do love getting that into organizing. 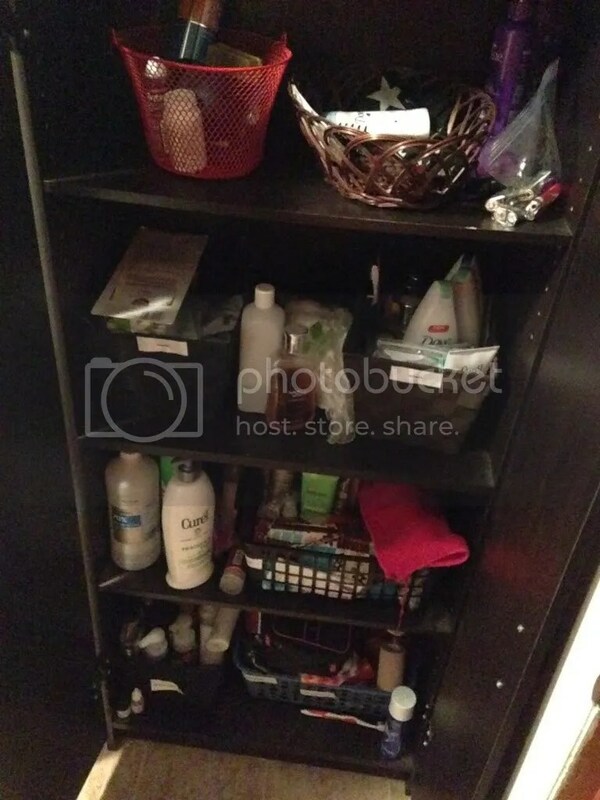 The reason I gave that little background was because my most recent organizing spurt happened in the bathroom. When I moved in my bathroom consisted of a shower, toilet, medicine cabinet & a sink on a VERY small vanity. I’m talking the entire thing is maybe a foot wide which left me hmm about no room underneath for storage. I ended up putting a couple cabinets from Target in there that I already had from where I’d lived before & using them for storage. While I love Target dearly, I’d had the cabinets for several years already & lo & behold one of the doors recently broke off. I didn’t want that junky looking cabinet with only 1 door in my bathroom & I’d already been toying with the idea to move it into the laundry room so it seemed like a sign. After doing a switcheroo of moving the laundry baskets to the bathroom & that broken door cabinet to the laundry room I realized something. When you put short laundry baskets where tall cabinets used to be you discover bad paint ideas that you had thought would be a good idea when you first moved in. 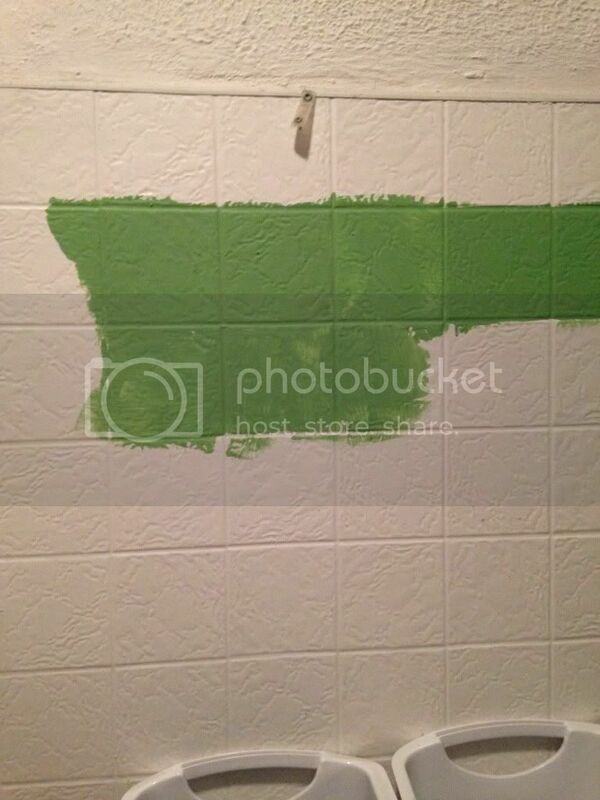 All I could do was laugh though because I’d forgotten about the time when I thought I wanted to paint the bottom half of my bathroom walls green. Oops. I’ll figure something out for it later because I have many ideas in my head for what I want to do to the bathroom as far as remodel but that’s for another day. Here’s the current view that’s front & center when you’re popping a squat. So anyway I go from 2 cabinets down to 1 & I figure it’s a good idea to empty all the cabinets to sort & purge stuff I’d long forgotten about. 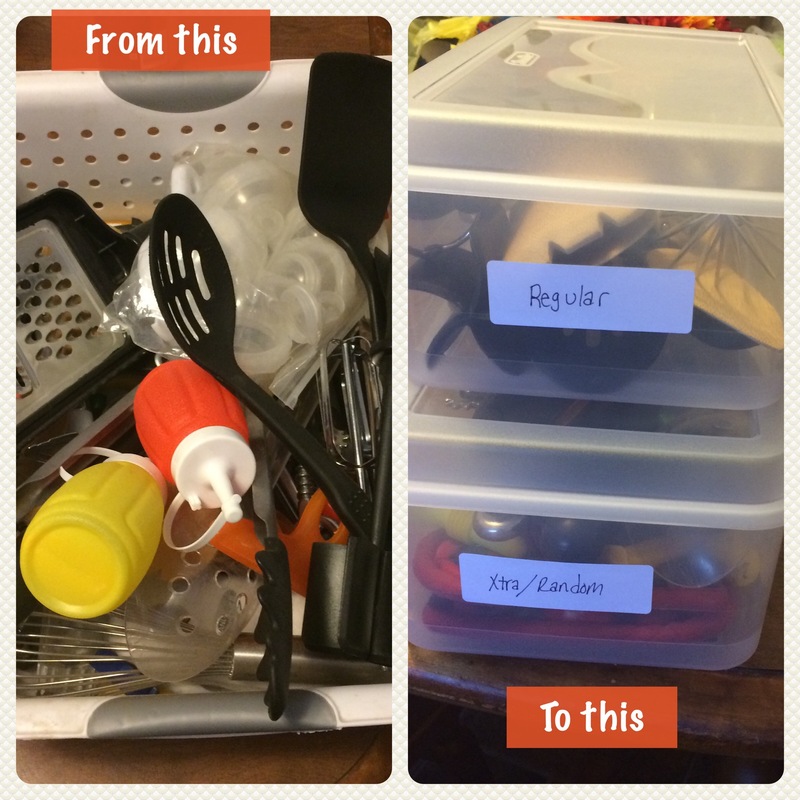 I can’t tell you how good it felt to purge a lot of junk & get the cabinet more organized that it had ever been – even when I had 2 cabinets in there, they weren’t nearly this organized. Of course, I got so wrapped up in it I didn’t get the “before” picture but I do have a lovely “after” that makes me happy. Sorry for the crappy iPhone picture quality – it’s one thing that’s always handy & not ever far from me. Is Mother Nature on crack? Where is my Fall weather?? This is not cooler temperatures & hoodie weather! I am not a happy camper right now! This past week I went to the Pumpkin Festival with my mom & sister like we do every year but it was no hoodie weather like it’s supposed to be. It doesn’t really seem like cooler weather is happening anytime soon either. The leaves are falling & some already have beautiful colors but this heat has got to go! Okay enough complaining because I’m not one to complain but I’m sorry, I’m not a hot weather person. Don’t get me wrong I enjoy Summer, but it’s only supposed to be here for a few months :) Jamie & I have been walking again which feels awesome! It’s great it general to be able to walk even normal walking without pain in my ankle. It was really bad & so I am very thankful to be pain free on a regular basis. We did the 5k which was fun, but I have to say the Dirty Girl 5k was much more fun. Then again the Dirty Girl did have mud, obstacles & beer at the end so that’s hard to beat. haha The Color Run wasn’t bad though – the color blast areas were fun & the dance party afterwards was good. We weren’t doing it for the time but we didn’t do too terrible. We jogged some parts though mostly we walked – but at a good pace. I did see some people cutting across though & coming back early to not complete the entire walk & I felt pretty proud of myself that I didn’t even think to be a cheater like that. I certainly didn’t do it for the time, but I wouldn’t dare claim that I completed the 5k if I didn’t even walk the entire distance. Bums! I’ve been spending more time on Pinterest again because #1 I’m addicted & I have no shame in that & #2 there are some amazing ideas on there (not to mention great recipes). Recently I saw a pin someone had linked to a blog that shows you how to hang clothes quicker. As I read the post it sounded like a decent idea & when I watched the video I thought this sounds silly but that looks like she hung clothes much quicker than I ever do. I’m great at staying on laundry & keeping it washed & dried but as far as actually folding it & putting it up promptly … I’m more likely to fluff clothes in the dryer 3-4 times before I get around to it. However the other day I personally tried out her shortcut to hanging up clothes & it took MUCH less time than before. I love these smart women who are great enough to share their tricks with the rest of the world! Here is the link to the YouTube clip of her demonstration. I also saw on Pinterest this morning a trick for using pants hangers for boots. Which was good timing because I’d been trying to think lately of how to store my boots. I don’t have very many pairs but they take up a lot of room & my shoe stand at the door doesn’t have a place for boots so they just all sit in the floor which gets in the way & on my nerves. So I tried it out & sure enough it worked! I’m not super crazy about it for a permanent solution but for right now to get the boots out of the way & out of sight – I’ll take it! Here is the pin that shows the picture of how to hang boots. I don’t have pants hangers like that – the clips don’t slide on them but I just pinched the boots together & clipped one boot on each clip & it works just fine. It’s not as pretty as the picture, but I wasn’t going for pretty just convenient & since it got them off my floor I’d say that’s a success. I’m trying to stay motivated to do more things around the house to make it more useful & more into the home I want. Since my funds are low that’s not exactly easy, but I don’t expect to get it all done at once & thanks to pinterest I’m finding a lot of cheaper options & DIY’s for things I want to do. It’s hard to see so much of my paycheck going to credit card debt every month – but I made the bad choices that got me there so I have to deal with it. I just keep telling myself in a few years when it’s all paid off, I’ll be glad & not let myself get back into that terrible situation again. I won’t know what to do with all that extra money. Just kidding! Thanks to Dave Ramsey I know exactly what I’ll be doing with it & paying on credit cards won’t be a part of it! A little over 2 weeks ago – I think it was Tuesday 8/20 I had some serious pain in my right ankle so bad where it hurt to walk at all. I obviously toughed it out to still do normal walking but I put my walking/jogging exercise on hold which I hated! Finally that Friday I went to Medexpress because it wasn’t any better & found out I had tendinitis which unfortunately there’s no quick fix for. :( You basically have to rest, ice it & where a brace/wrap & hope for the best. Here we are 2 weeks later & I’m no better. I have good days where it doesn’t hurt much & I think I’m in the clear but then the next day I’m in excruciating pain. I can’t express how much I hate not walking! I’m so much more irritable & in a foul mood. Not to mention when the weather is cooler on some days (which means Fall is just around the corner – YAY!) it’s even worse because I love being outside especially then. This is probably one of the worst things I’ve ever gone through because there’s no quick fix it’s just a wait it out kind of thing & patience is not one of my virtues. So I’m trying to use my down time to reorganize the house & purge. I haven’t made much progress because I had been hoping I’d be all healed up by now but since it doesn’t seem to be a quick process I might as well make myself useful at home. Fingers crossed this goes well! I’ve never been an organized person & lord knows it doesn’t come natural to me, but there’s always hope right? Well somebody's been a slacker – yes, that would be me. I don't know what happens. I get on kicks & do great with updating even with pictures (which we all know gets bonus points) & then sometimes it's as if I fell off the face of the planet. But – go ahead & cancel the search party, I'm still here. I also celebrated a birthday & while I’m not over the hill or close to it yet, I am already at the point that I don’t really care about them anymore. I do still enjoy cake & getting everybody together. I had a few friends & some family over & honestly it was probably one of the best birthdays that I’ve had yet. & I FINALLY got a flip n fold after asking for one for YEARS. Yes, I know I could’ve just bought one myself but that’s not the point. Needless to say Paul got moved to the top of my list for that one! As far as finances, yeah that hasn’t got much better. I actually took out another loan to buy a truck off my dad. Just what I need right? A new payment & additional cost on my insurance. I do really want a truck & it’s proved to be beneficial so far but I’m not 100% sure if I’m going to keep it. For fitness I had been on a walking kick & doing really good. I pushed myself a few times to reach the 1 mile mark before turning around (which make for a 2mile trip total woohoo). I tell you – 2 miles on a track & 2 miles up a rural hilly road are WAY different. I actually prefer the rural road to be honest because you don’t see the exact same scenery each time like you do when walking on a track. I haven’t walked for a few weeks now & I’m disappointed in myself & I can tell I’m lacking for energy too. I’m walking tonight though regardless of the weather & I’ve been trying to really get myself motivated to get more active & eat better. So here’s to progress!